Add OE Fog Light Adapter Harness? 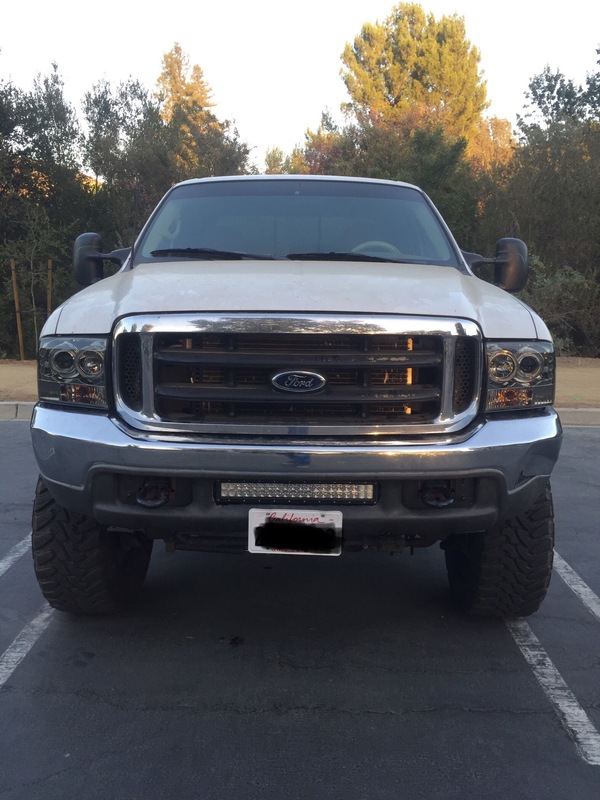 If your 99.5-04 Ford Superduty F250 or F350 Truck did not come with factory foglights, or if you would like to replace your factory foglights....this bracket kit will put a 20" LED light bar in the bumper opening using the existing holes in the bumper. A great way to get plenty of light with a low profile design. Laser cut from 1/8" steel, CNC bent for precision, and powder coated semi-gloss black for great looks. Keep in mind that this will replace your factory foglights. **Will Not Fit Early 99 Trucks. Early 99 model trucks have a production date of 3/99 and earlier. !!! ---- Please note that these brackets are designed to fit with LED light bars that use an end-style L bracket mounting. NOT the kind of light bars that use a sliding bracket on the housing of the light. ---- !!! The brackets have some adjustment for different manufacturers 20" bars. Rigid 20" E-series bars are 21.375" end-to-end. Other bars like LifetimeLED state their 21.5" bars are actually 21.5" end-to-end. Replacing the factory foglights? Add on an adapter harness! One end plugs directly into your factory foglight plug, the other end has a Deutsche style connector which is commonly used by light bar manufacturer's (Rigid, CSI). You must have the factory foglight circuit installed on your truck. Easy to install. Fit perfectly. Bought these for my F250 and couldn’t ask for anything better! Very happy with the quality and certainly worth the price paid. Bought 2 sets of these , 1 for Excursion and 1 for F250. They aren't cheap but the product backs that up with quality and Fit n finish. Plus all the hardware required.. VERY NICE ! High quality perfect fit overall a really good product that should last for a long time. 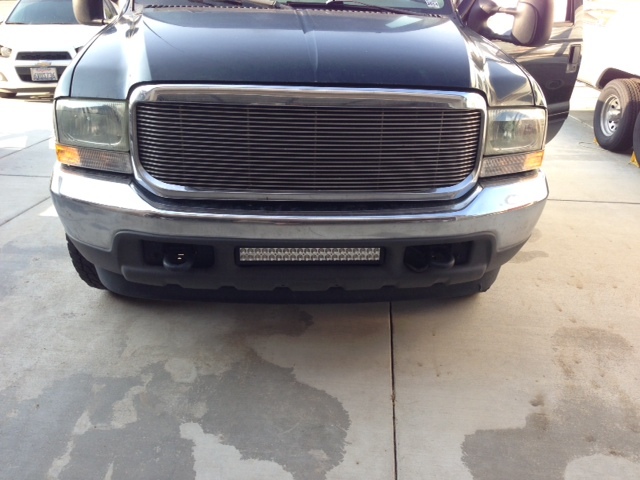 I recently ordered the brackets to mount my light bar to the fog light siection of my bumper on my 04 f250. Everything ablut my experience was great. I ordered the product and had no issues there. It came in with in 3 to 4 days. The brackets themselves were built great, they mounted up nice, and everything about my experience was great. I would buy more stuff from these guys without hesitation. 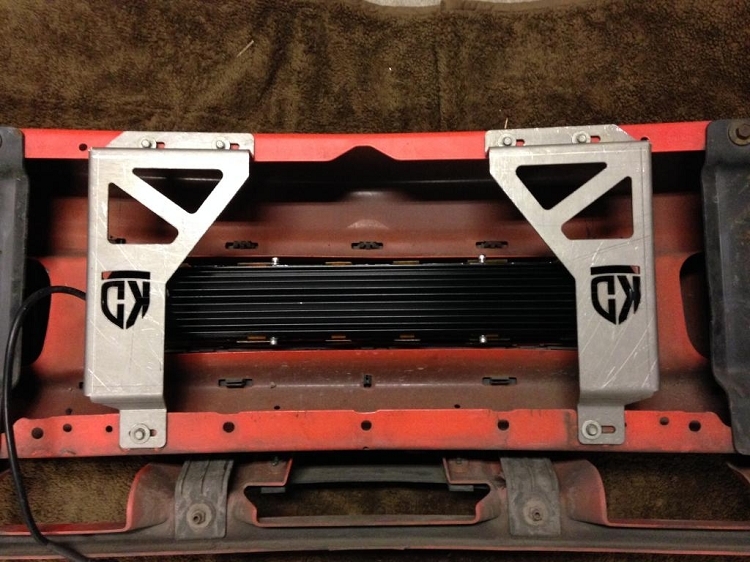 Awesome product, I wanted my truck to retain the "stock" appearance and not have a bulky light bar sticking out. These mounts do just that, the light bar is neatly tucked away in the fog light slot. They are well made and easy to install took me and a friend about 30 minutes to install. I'd recommend this product to anyone, I thought they were kind of expensive just for mounts but they are great quality and a clean fit. Worth every penny in my opinion. I looked all over other manufacturers sites for a brackets to fit a 99.5 powerstroke and none of them listed a bracket(s). 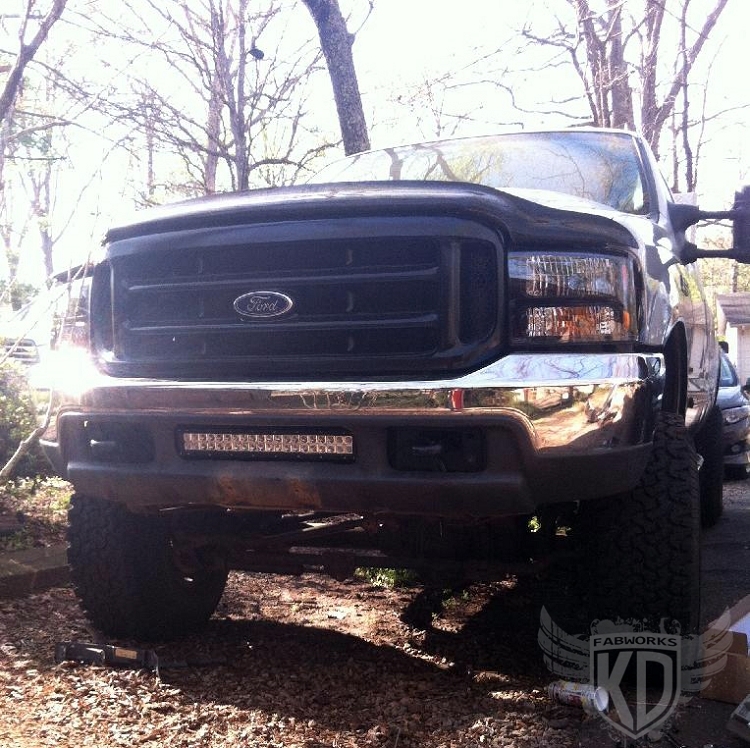 I contacted KD Fabworks and asked if the brackets for the newer model would fit my truck. They gave me the part number for the brackets that would fit and I placed my order. When the brackets arrived I thought, "these things are to nice to be hidden behind the bumper where no one would see them." They seem extremely well made, look good and fit perfectly. 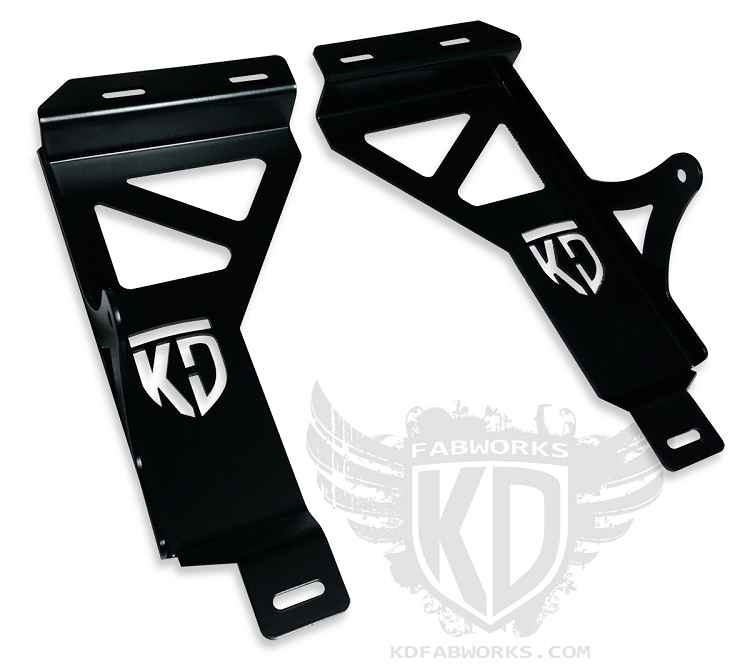 Anyone looking for brackets to fit their 99.5-'04 superduty can stop looking and go directly to KD Fabworks.